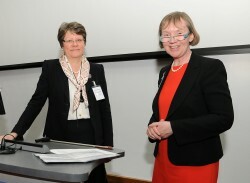 The 2012 EPC Congress took place at the University of Leicester on 17/18 April 2012. Themes included the REF, SIVS, employability of graduate engineers and the new funding regime. The Distinguished Guest Lecture was given by Professor Julia King CBE, Vice Chancellor of Aston University, and this was followed by the Congress Dinner at the Belmont Hotel, on the evening of 17th April.